"For the first time in history, two mobile robots are exploring the surface of another planet at the same time." NASA's Mars Opportunity rover rolled out of its lander in the Meridiani Planum at 3:01 a.m. PST on January 31, 2004. Image credit: NASA/JPL/Cornell University. January 31, 2004 Pasadena, California - Early this morning, NASA got the Mars Opportunity lander moving a few days before schedule and out onto the soil of the Meridiani Planum shallow crater it landed in. Controllers at NASA's Jet Propulsion Laboratory received confirmation of the successful drive at 3:01 a.m. Pacific Standard Time via a relay from the Mars Odyssey orbiter and Earth reception by the Deep Space Network. Cheers erupted a minute later when Opportunity sent a picture looking back at the now-empty lander and showing wheel tracks in the Martian soil. 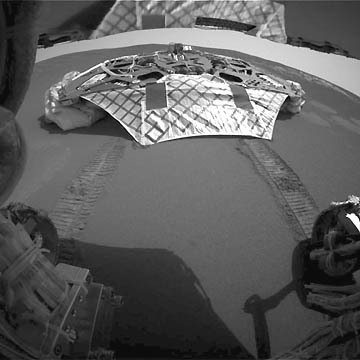 Opportunity drove down a reinforced fabric ramp at the front of its lander platform.